Flute Tutorial Lessons Series: For Foothill Middle School Students, Fall Chair Auditions. The videos below show demonstrations and practicing suggestions so you can play your very best at this upcoming placement audition. Good luck and have fun! One of my greatest joys as a teacher is sharing this amazing instrument with others. I have been truly inspired by all of my students, but my Native American Flute groups have held a special place in my heart. They inspired me to write a collection of multi-level duets and rounds so that this instrument can be shared together more easily. I encourage all my students, student’s parents, family and friends to try this instrument because of its wonderful meditative qualities. It is one of the more straight forward instruments to start because you can make a sound on it right away. Just blow gently to create a warm and wonderful tone! With just 5 minutes a day you can begin to see progress quickly! Like with any instrument to truly ‘master’ it will take time and dedication. This is not an ‘easy’ instrument, but it is very user friendly instrument to begin at any stage of your life! It is with great joy, that I offer this book as a free download. My hope is that more teachers will share the instrument with their studios, and that flute circles will have another resource to use with muli-level groups! 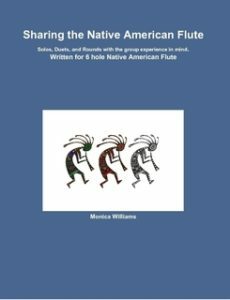 Sharing the Native American Flute, a book for playing the Native American Flute in a group setting (duets, rounds, and instructions for starting and advancing on the instrument) is now available!